If you get a new puppy or just a rescue dog with behavior difficulties, learning the basics and beyond of the benefits of dog walking can be the miracle that saves your day to day life with your pup. If you require outside help with how to establish a personalized routine, we recommend you research a behaviorist or trainer in addition to taking group classes. 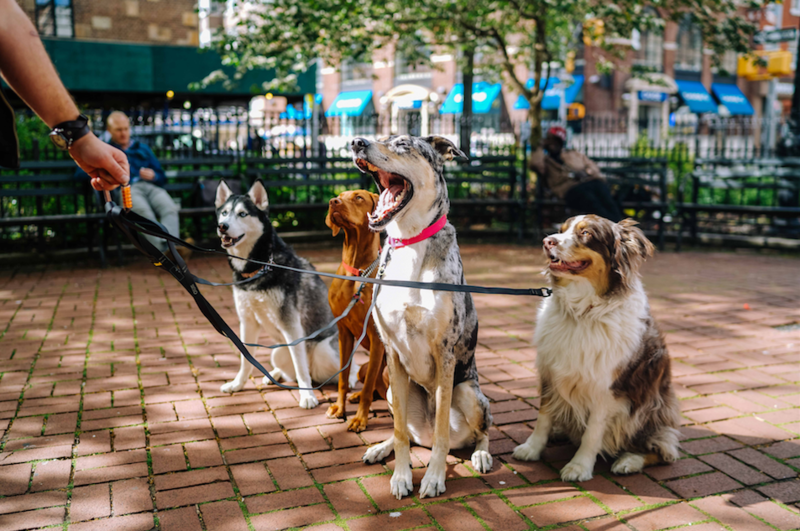 Group classes will most likely benefit you in terms of cost savings, but also you can work with a trainer that already has a rapport with you and your dog and trust has already been established in the classroom. Many basic dog training courses will address obedience and some recall- but dog walking and potty training are generally reserved for private sessions in your home and can assist you to dog acclimate to a regular potty schedule. Whether you have a new puppy or a rescue pup who has not been outside of the house on a leash, it is important to establish a good relationship of comfortability and trust between the dog walking accessories and the dog. This positive pairing may be established relatively quickly and over time. Some dogs may have never worn a collar or harness before due to being a puppy mill dog, or just being a brand new puppy. Regardless, learn the history of you pup as best as you can- be gentle and remember being calm and confident are the two leading energies to get your dog to trust you that you know what you are doing– new mom and new dad! Introduce the new item by letting them sniff if, when the dog is in a calm/restful mood and you are in a position of calm yourself (times to avoid would be rushing in from a dog supply run after getting the pup as a spontaneous adoption/purchase as this excited hurried energy is going to push energy at your dog which is not leaderhsip quality behavior in a dogs language). Let your dog walk around your home with the harness/collar on for a few mins to start and slowly increase the time by minutes over the course of the day. Also take the harness / collar off gently to create a positive association with the item. Please note that rescued dogs might be more likley to run away out of fear, so if you feel this is the case, do not take the collar/harness off- safety first!! Our clients love the eaze-walk lead or the gentle leader. Just as above, introduce the leash by letting your pup sniff it at a time when both you and your pup are calm. Next, go ahead and attaching it to the harness/collar for a few minutes at a time. Be sure to monitor your dog if its being attached to the collar as you don’t want the dog to accidently choke itself. We highly recommend using a leash that is not a retractable one as they are not ideal for training nor dog walking. After your pup has a positive association with the leash being attached, gently guide him/her throughout your home and down the hallway. If you have a backyard or front lawn, feel free to extend the area to include this territory as well. Some good commands for your dog to begin to master would be “stay, heal, leave it and “hurry up”. These four commands can be clutch in the event that you accidently drop the leash, your pup accidently escapes its harness or collar or your dog runs out your front door. The costs of dog walking can quickly add up -especially if your pup is not good with other dogs or is learning how to walk on a leash or is especially active (a dog like likes to sniff everything or is an excessive puller). Master the above commands and get your dog into daycare at least 1x per week, get your pup on daily group walks or walks 2-3 times per week and you’re looking at one happy pooch!